The first Ethical Expo will be held on the 9th and 10th May 2008, incorporating International Fairtrade Day. "Ethical Expo will help consumers make the right choices by bringing together producers, distributors, resellers and the public. Ethical Expo will cover three areas; Eating, Wearing and Living, with seminars, demonstrations, shows and stands." "With 60 major exhibitors, a programme of seminars,workshops and key speakers all designed to educate, inform and enthuse the public, Ethical Expo expects in excess of 10,000 visitors over the two days." 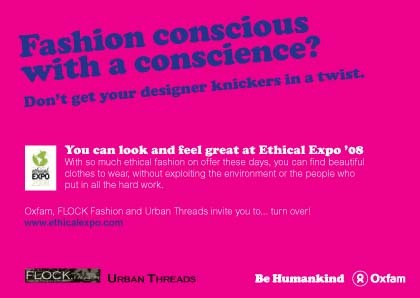 Pouch will be taking part in an ethical fashion show at the event on 10th May.